This rather hefty device looks more like a weapon but behaves like some planetary object. It is called the Orbiter with a reason; it is designed to allow drilling or screwdriving at all sorts of odd angles when nothing else will do. It is worked by undoing a small lock button and twisting the soft rubber faced hand grip anti-clockwise so the two halves move independently. This allows you to achieve any angle from straight ahead to 90º and any angle in between, with the handgrip also at any desired angle to the rest of it. 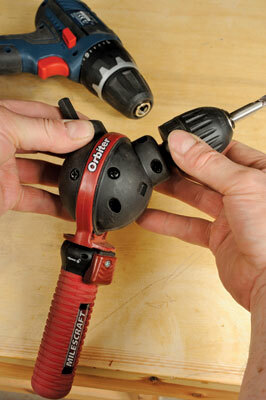 It features a keyless chuck and a substantial drive shaft to fit your own drill's chuck. It certainly works, we can confirm that. 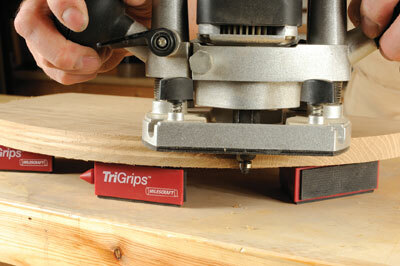 First we had Bench Cookies, then Loc Blocks and now we've got TriGrips from Milescraft. At first we thought "not another work support" however, these are rather neat; the special foam impregnated non-slip skin holds any type of material in place and they have a nice soft grade of rubber on both faces and the bottom edges, too. They are very solid and accurately moulded to a point making them dual purpose not just for supporting and holding work such as routing edge work but also as 'painters points'. 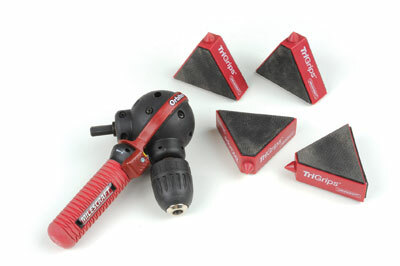 They can be used flat, holding a work piece 30mm above the bench top, or in vertical mode will lift a job 75mm for applying finishes without marking the bench or getting dust and mess on your precious work. We like them.